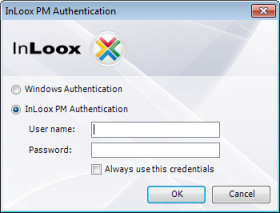 Choose between Windows Authentication and InLoox PM Authentication to logon to InLoox PM 7. Create an InLoox PM account to be able to logon as InLoox PM user. For more information see Create an InLoox PM account. On the InLoox PM tab, in the Extras group, click Log on as. In Outlook 2003/2007, click InLoox PM Folder in the InLoox PM Toolbar and then Log on as. On the InLoox PM Authentication dialog box choose InLoox PM Authentication. Type your user name for the InLoox PM authentication in the User name field. Activate the Always use this credentials check box, if you want to save your authentication data in the system. As an InLoox PM User, you can change your password anytime. See Create an InLoox PM account in the Change the InLoox PM password section. How to log on with the InLoox PM 7 user credentials • Copyright 1999-2019 © InLoox, Inc. All rights reserved.